This Maasai Trails camp is located in the Loita Naimina Enkyio Forest. The camp is situated on top of the Oltyiani giving way to break taking views of the Rift Valley with the Ngorongoro Mountains in the distance. Despite it's remote location in the Loita forest, the team take pride in hosting a comfortable and welcoming bush camp. The team will set up the tents ready for your arrival. You are greeted with a smile and a cold drink. Later, after sundowners, a tasty meal is prepared over the fire. After dinner you can sit and chat around the crackling campfire, then listen to the sounds of nature as you drift of to sleep in your cosy tent. Each spacious bell tent comes complete with two bedrolls, bedding, pillows, duvets and towels. Hot water bottles are a welcome addition on a chilly night. It's simple, but very comfortable. The tents are tall enough to stand up in too. Outside each tent is a canvas washbasin and inside you have a light. The camp has a tented shower and a tented short-drop loo which guests will share. There is a mess tent with a bar area and the camp fire will be built close to this. This is bush camping in comfort. Each morning the donkey caravan is packed up and they head off to the next location to set up camp. Each night, they are looked after in a thorn enclosure at night to keep them safe. Your days will be spent exploring the ancient trails. The walks are not terribly difficult but you should be fairly fit in order to enjoy the experience. Due to the altitude and terrain, each day you should spend about 6 hours walking in total. Three in the morning and then there's a lunch break before you head off in the afternoon for another three hours. 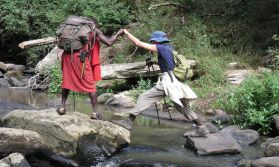 You will come across different eco-systems and habitats together with your wonderful Maasai guides who will share their extensive knowledge with you, every step of the way. River Camp and Ossasini Camp are an identical set up to Oltyiani Camp, only the location differs.